Built to resemble the United States Capitol in Washington D.C., the gorgeous Georgia State Capitol Building has long been a popular Atlanta location for engagement and wedding photography in Atlanta. Upon arriving at the capitol building, you and your fiancée can pose for a portrait standing or seated on the front steps, using the stunning Renaissance revival architecture as a backdrop. Afterward, take some photos beside one of the six towering columns, which support the building’s west-facing façade. There are also several stone benches near the entrance steps that will make a perfect spot for a private portrait. Venture inside the capitol building and you’ll find yourselves inside the beautifully-lit rotunda. One either side of the rotunda there is a grand staircase along which you and your fiancée can pose for some great photos. The two of you can also pose on the balconies overlooking the interior rotunda. Once you’ve finished at the capitol building, take a short drive over to Grant Park, located just over a mile away. During your engagement photo shoot at Atlanta’s oldest park, you and your loved one can pose for an intimate portrait beneath one of the large shade trees. Take a leisurely stroll along one of the park’s winding pathways as your engagement photographer snaps some candid photos. Your photographer can also take photos of you and your fiancée beside the lake, using the sparkling fountains as a backdrop. Spanning thirty acres adjacent to Atlanta’s Piedmont Park, the Atlanta Botanical Garden’s vibrant exhibits and natural landscape make it a wonderful location for your engagement photography session. Start off your engagement photo shoot at the Japanese Garden, where you and your loved one can take some photos beneath the blooming cherry blossom trees or using the ubiquitous lush greenery as a backdrop. You can also pose on the large stones scattered throughout the garden or beside the tranquil lily pond. Afterward, head over to the Rose Garden, and take some photos surrounded by an array of colorful rose bushes. Next, walk over to the Dorothy Chapman Fuqua Conservatory, which features a number of indoor exhibits that focus on plants from tropical rainforests and desert habitats. You can your fiancée can also pose for some photos outside the conservatory on the expansive green lawn or beside the glimmering fountain in front of the building. You can then head over to the adjacent orchid center and have your engagement photographer take some snapshots of you and your fiancée surrounded by the largest orchid collection in the entire country. You’ll never forget your engagement photo shoot at the fabulous Atlanta Botanical Garden! A newly redeveloped residential and retail district near Midtown Atlanta, Atlantic Station will make a great location for your engagement photography session. Begin your photo shoot at the Millennium Gate, a beautiful gigantic arch in the center of the district dedicated Georgian history and heritage. Here, you and your fiancée can take photos seated on one of the cozy marble benches facing the arch. Have a seat at any of the small tables encompassed by the gate for a great private portrait. Afterward, you and your loved one can pose beside one of the gate’s huge Doric columns, as well as beneath the arches located toward the interior of the gate. Finally, have your engagement photographer take a photo of the two of you standing in the middle of the gate, using the monument’s surrounding Classical architecture as a stunning background. Once you’ve finished at the Millennium Gate, head over to the neighborhood’s Midtown Bridge. You and your fiancée can take a promenade along the bridge as your engagement photographer snaps some casual photos. Afterward, pose along the bridge against the backdrop of the sparkling pond below for some truly romantic photos. You and your loved one can also take a walk around the perimeter of the pond, pausing for portraits beneath the surrounding shade trees or seated on any of the benches scattered throughout the area. 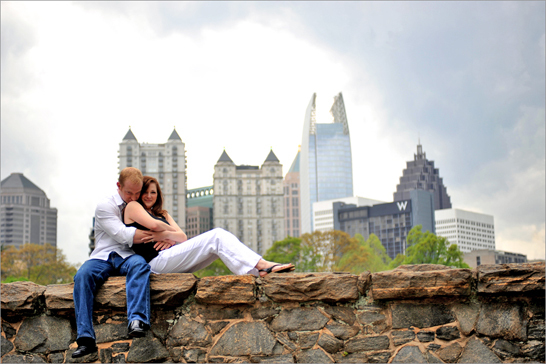 You’ll have a blast during your engagement photoshoot at the charming new Atlantic Station neighborhood.